It takes insurance companies weeks, sometimes months, to underwrite a policy. Much of the information is collected through traditional faxes and mail. Information is entered into multiple systems, multiple times, making the process redundant and exposed to errors. An underwriter often has to rely on third party data sources like the MIB, MVR, APS/Paramed, and Inspection Companies to make decisions. Planet Interact addresses the challenge by providing a framework that can cohesively tighten the process by collecting data through web-based interfaces, intelligently routing workflow based on business rules, and connecting internal and external systems. 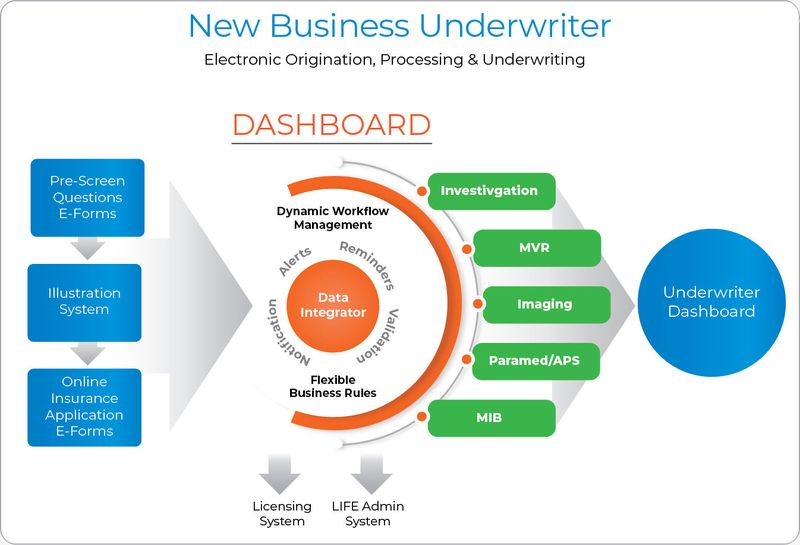 The Policy Processor™ is the industry's most advanced and comprehensive new business processing and underwriting system for life insurance. TPP accommodates all life insurance products, across all distribution channels. The application is integrated with a heterogeneous mix of on-house and third party systems. The information is collected from both the end-customer and agent through web-based e-forms, as well as from external data sources for background checks. TPP provides a means of straight through processing of underwriting information for medically underwritten as well as jet underwritten cases. Electronic front-end for capturing application data. Agent licensing and appointment verification. Electronic ordering and receipt of requirements. Integration with imaging technology for document management. 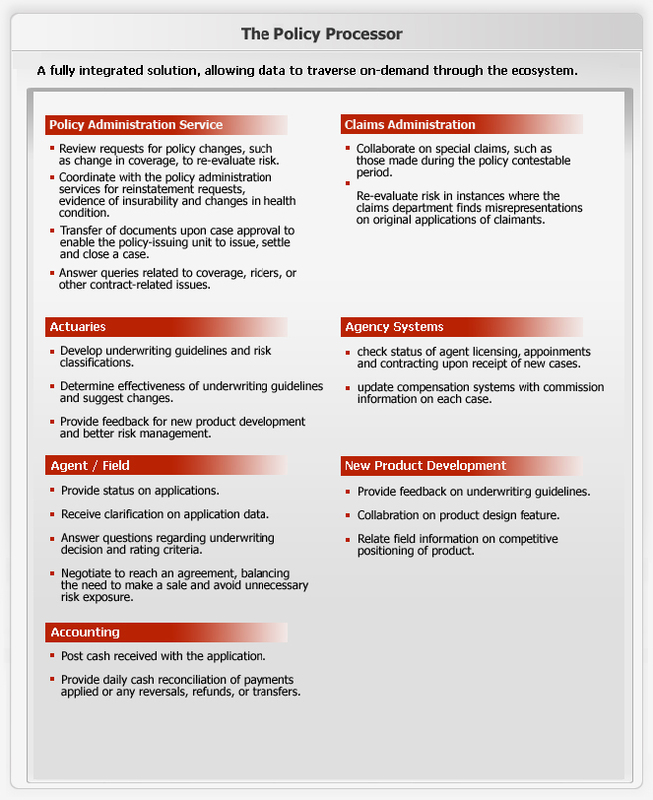 Underwriting dashboard for case assessment and decision. Dynamic and configurable communication modules including emails and document correspondence. Table-driven management of underwriting and administrative requirements. Automatic determination and population of state form requirements. Support for ACORD XMLife Standards. Wizard-based administrative interface to configure new products. 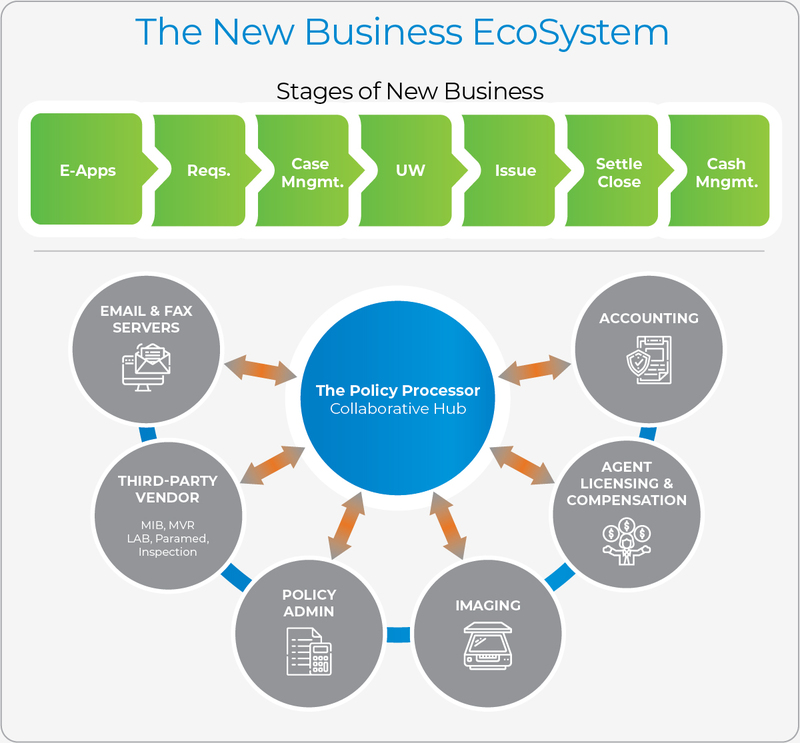 The Policy Processor™ forms a collaborative network hub, connecting organizations, systems, and people in the new business processing service chain. The underwriting and new business processing departments have to work collaboratively with several departments within the company, as well as with outside vendors and agents in the field. With the TPP, the ecosystem is connected, making it possible for seamless, accurate, and expeditious processing of new business cases. Within an organization, The Policy Processor™ enables data to traverse on demand through various departments - creating a seamless and connected ecosystem.